One time in my life I thought it was only the artist that matters. But alas, it is very much like the music world. There is the singer/artist, then there are the arrangers/producers. If you map it out there is the artist, the curator, and then the audience for that art. Or perhaps the curator is a translator? Nevertheless this is a fascinating collection of interviews done by curator/writer Hans Ulrich Obrist on really cutting edge curators from the 60's, 70's era and upwards. It is good he started with Walter Hopps, because I think he's the curator with the most strongest identity of sorts, in that he's a legend (rightfully so) and in many ways an artist himself. The way he looks at exhibitions is more of an aesthetic thing than a business decision. So with that as the foundation, Obrist goes on with numerous interesting individuals regarding the art of the exhibition and the politics of museums. But mostly this is a very up-beat look at the inner-world of a curator and what they do. Obrist asks very pointed and clear questions to his subjects, and they themselves come up with an answer that exposes not only their thoughts but also there love for the artist and their medium. But beyond that it is also a book about 'Taste' and what that means to the world, especially when you use taste to promote a specific vision to the world. A very specific world I might add. By nature i think a curator is very much a show-and-tell type of character. It is someone who is totally turned on by an idea or a work and needs to expose it. That is it. Also the skill of the curator is also social skills, because you need to communicate that idea to others who may not be in your particular world. Not that far from the book editor or publisher in that sense. Nevertheless there is not that many books on the subject of curating, so this makes it important, as well as an enjoyable read. In the book he interviews Lucy Lippard, Hopps (as mentioned), Pontus Hultén, and Anne d'Harnoncourt among others. Dip into this book, because you are going to pay a lot of money for it once it goes out of print. Ideal for curators. I cannot imagine this book as interesting to anyone outside of the curatorial field as there is so much name-dropping both in terms of exhibitions and of artists, if one did not already have a very solid background in art history he or she would be reading Wikipedia more often than the book. It covers most of the landmark exhibitions from the past 50 years which is impressive. I finished it with many more exhibition ideas than when I started it. К современному искусству я отношусь с большим пиететом (ну, в том смысле, если это действительно искусство, а не акционизм, в ходе которого к брусчатке Красной площади прибивает мошонку не совсем здоровый "художник"). Есть даже определённая ирония в том, что первое "большое" свидание с моей обожаемой женой прошло на Московской биеннале в 2005-м - так что наш союз в каком-то роде отчасти вырос из угасшего жанра представления современного искусства для масс.Ну, а в этой книге исследовательский талант автора вновь проявляется во всей остроте - недавно я читал серию его интервью с современными композиторами, а теперь вот прочёл отличный сборник интервью с кураторами, организаторами, собирателями произведений. Определённо, общие места есть и их много.Плюс я, кажется, заново открыл для себя дадаизм (у меня к нему свой интерес, интерес к сюрреализму вообще), услышав новые для себя имена. This is a wonderful book with valuable interviews with Europe's first modern and contemporary art curators. Recognized names such as Polten Húlten really stand out for me personally although the Lucy Lippard and Seth Siegelub interviews are definitely the most engaging since they propose alternative sites for curating besides the museum. Hans Ulrich Obrist is one of my favorite interviewers since he always seems to know the complete background information of all his interviewees giving the reader a full examination of the social and historical viewpoint of each person. A collection of interviews with HUO and various curators, so some interviews are more interesting or insightful than others. 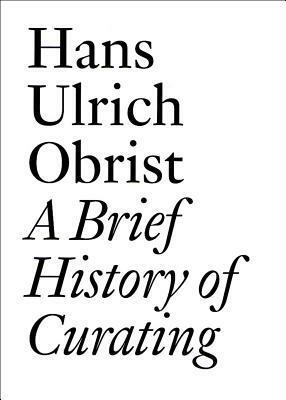 I would recommend this book, because it is the first major look at the history of curating, and Obrist is a seminal character in the development of curating (and the Contemporary art world in general). I would however recommend that you read this near by a computer for reference, because some names and places were completely unfamiliar to me. Enjoy! The interview with Walter Hopps is worth the price of the book. Loved it. Other interviews are great as well, but Walter is awesome. Hans Ulrich Obrist Lucy R. Lippard - Hans Ulrich Obrist is Co-director of the Serpentine Gallery in London. Prior to this, he was Curator of the Musée d’Art Moderne de la Ville in Paris from 2000 to 2006, as well as curator of Museum in progress, Vienna, from 1993 to 2000. Obrist has co-curated over 250 exhibitions since his first exhibition, the Kitchen show (World Soup) in 1991: including 1st Berlin Biennale, 1998; Utopia Station, 2003; 1st & 2nd Moscow Biennale, 2005 and 2007; Lyon Biennale, 2007; and Indian Highway, 2008-2011.Obrist is the editor of a series of conversation books published by Walther Koenig. He has also edited the writings of Gerhard Richter, Gilbert and George and Louise Bourgeois. He has contributed to over 200 book projects, his recent publications include A Brief History of Curating, dontstopdontstopdontstopdontstop, The future will be…with M/M (Paris), Interview with Hans-Peter Feldmann, and Ai Wei Wei Speaks, along with two volumes of his selected interviews (Interviews: Vol. 1 & 2). The Marathon series of public events was conceived by Hans Ulrich Obrist in Stuttgart in 2005. The first in the Serpentine series, the Interview Marathon in 2006, involved interviews with leading figures in contemporary culture over 24 hours, conducted by Obrist and architect Rem Koolhaas. This was followed by the Experiment Marathon, conceived by Obrist and artist Olafur Eliasson in 2007, the Manifesto Marathon in 2008, the Poetry Marathon in 2009, Map Marathon in 2010, and the Garden Marathon in 2011.In 2009, Obrist was made an Honorary Fellow of the Royal Institute of British Architects (RIBA). In March 2011, he was awarded the Bard College Award for Curatorial Excellence.